Marvel Comics Presents #104 MARVEL 1992 - Page 5. We offer LARGE pictures that once clicked, you can easily drag to your desktop for a closer look! A Beautiful page by Gene Colan and Al Williamson! Two classic artists, Gene Colan and Al Williamson, combined forces to illustrate an adventure of two fan-favorite X-Men, Wolverine and Nightcrawler! It's a unique page featuring the two mutant buddies riding a horse together! This was a bi-weekly anthology title that always featured a short Wolverine story along with a few other short features starring different Marvel characters! The image area is 11 x 17. Check out all of our other. Listings for more treasured collectibles. Boxed and well cushioned with bubble wrap/newspaper/packing peanuts. 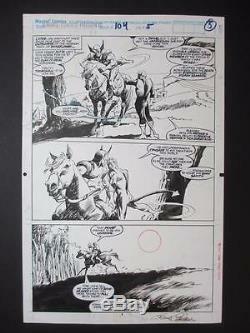 The item "Marvel Comics Presents #104 Original Art Page 5 Gene Colan Wolverine Horse 1992" is in sale since Tuesday, February 07, 2017. This item is in the category "Collectibles\Comics\Original Comic Art\Interior Pages". The seller is "collectors_comics" and is located in California. This item can be shipped worldwide.